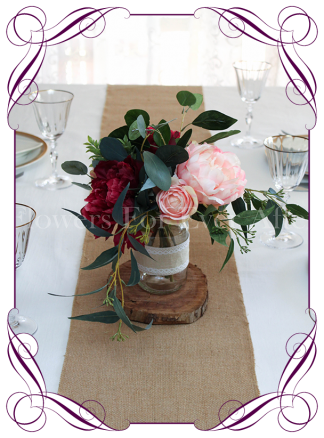 A delicate rustic posy of native, traditional, and textured blooms. 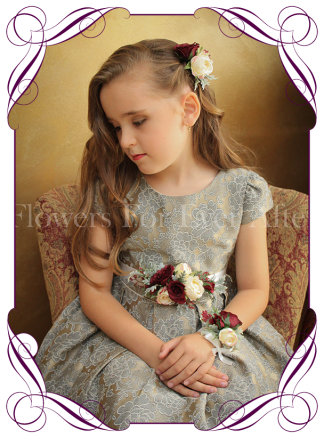 Will work perfectly with gowns in dusty pinks, berry, navy, brown, apricot, champagne, blush, sage, mushroom, burgundy, burnt orange, dusty blue, steele blue, grey/silver or black. 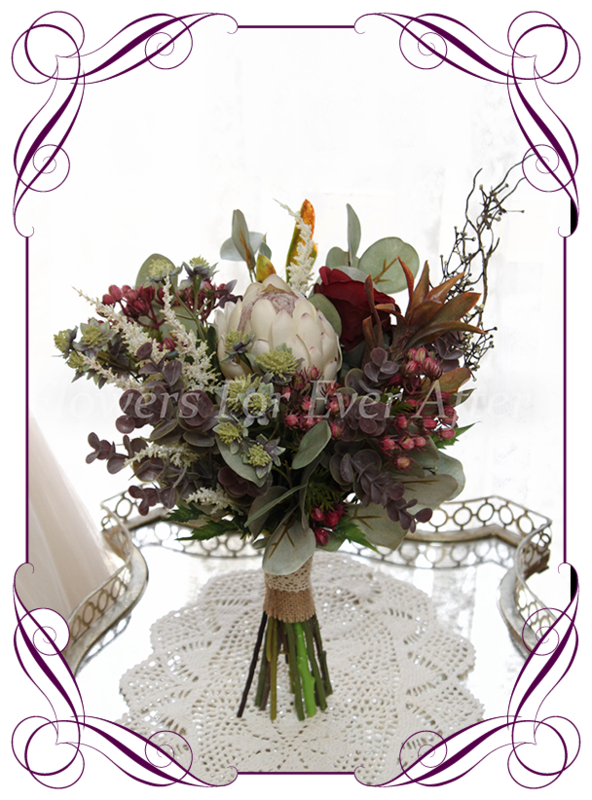 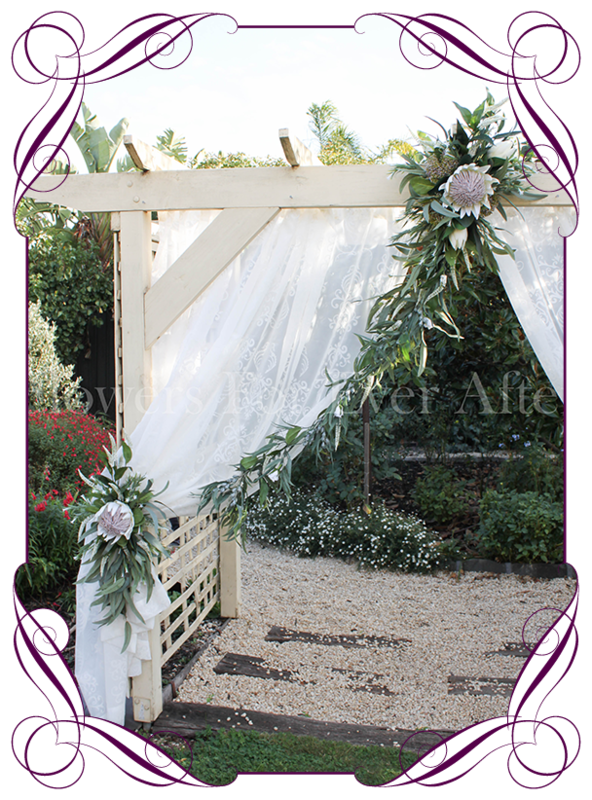 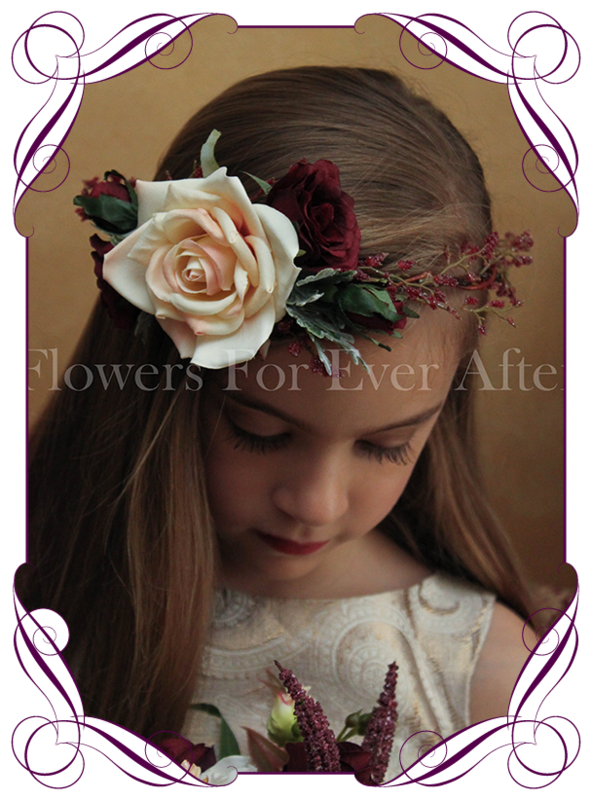 Bride – Features an ivory king protea, dark burgundy queen protea, burgundy peony, burgundy rose, mauve/green astrantia, cream pink/green brier berries, ivory astilbe, mushroom blue gum, leucondendron, twig branch, and sage eucalyptus foliage. Bouquet handle finished in burlap with a beaded sash. 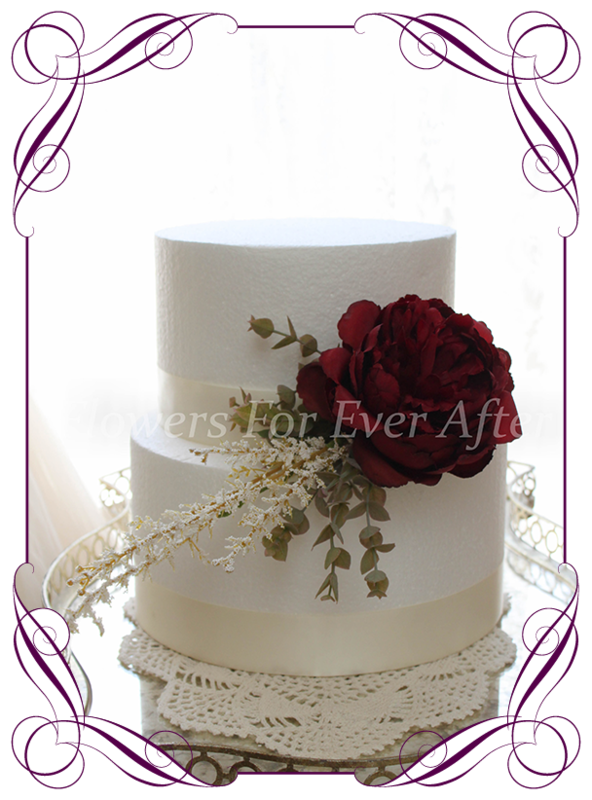 Measures approximately 30cm (12 inches) across at widest point. 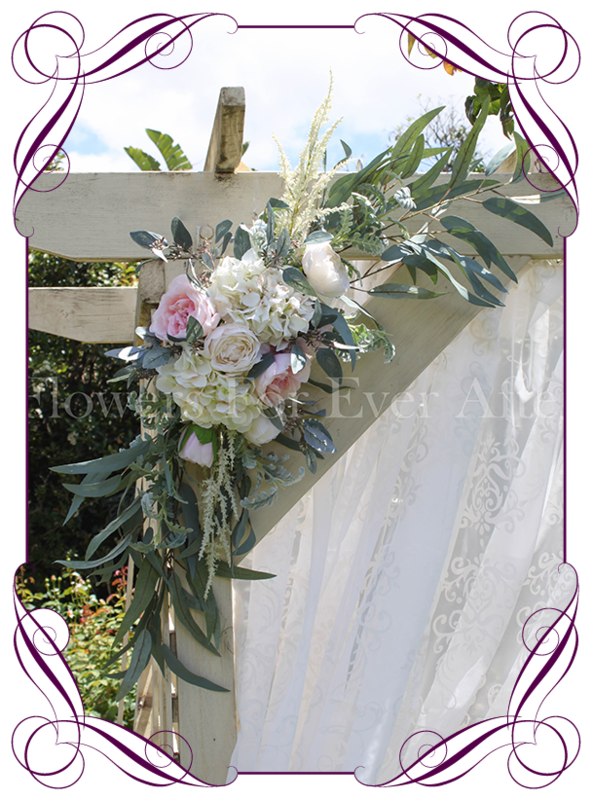 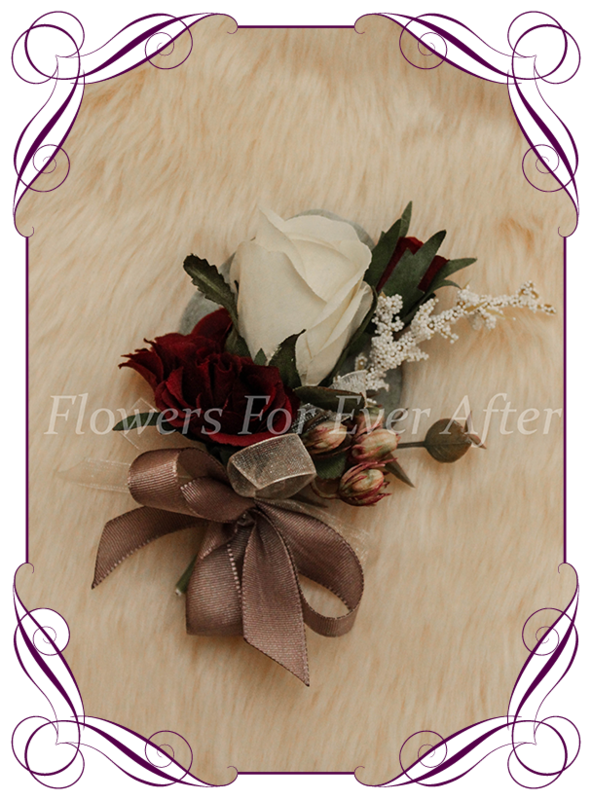 Bridesmaid – Features an ivory protea bud, burgundy rose, mauve/green astrantia, raspberry brier berries, ivory astilbe, mushroom blue gum, leucondendron, twig branch, and sage eucalyptus foliage. 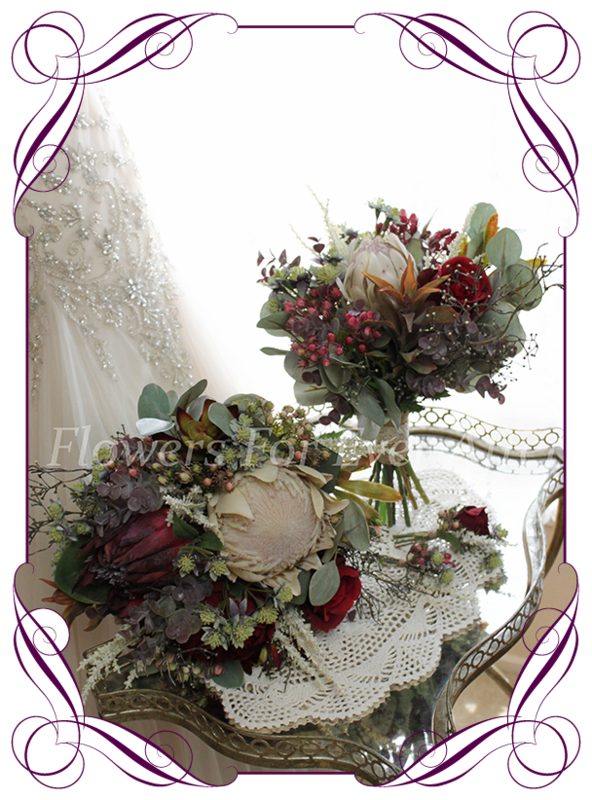 Bouquet handle finished in burlap with a crochet lace sash. 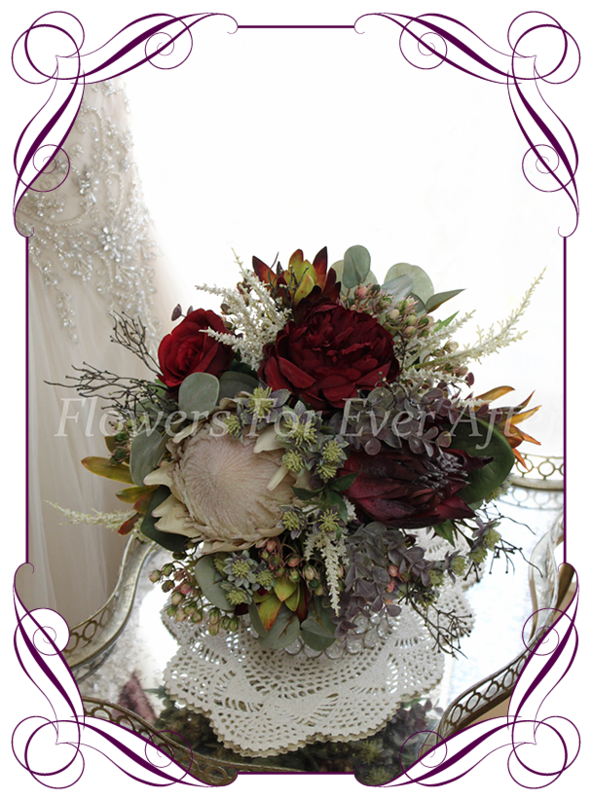 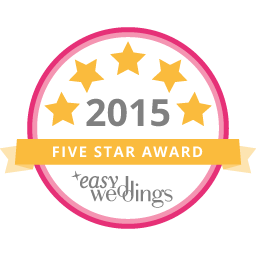 Measures approximately 24-25cm (9.5 inches) across at widest point. Features an ivory king protea, dark burgundy queen protea, burgundy peony, burgundy rose, mauve/green astrantia, cream pink/green brier berries, ivory astilbe, mushroom blue gum, leucondendron, twig branch, and sage eucalyptus foliage. 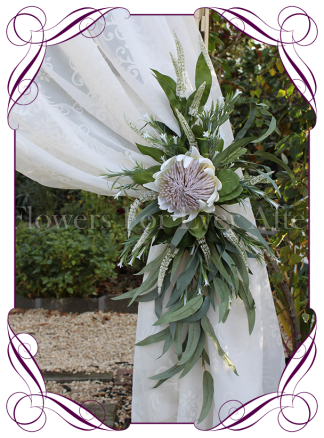 Bouquet handle finished in burlap with a beaded sash. 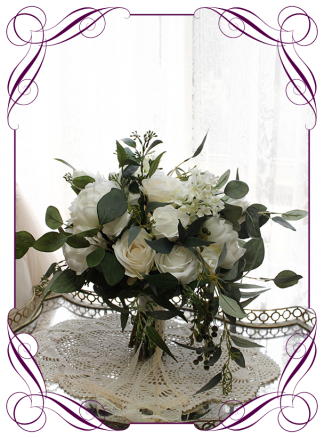 Measures approximately 30cm (12 inches) across at widest point. 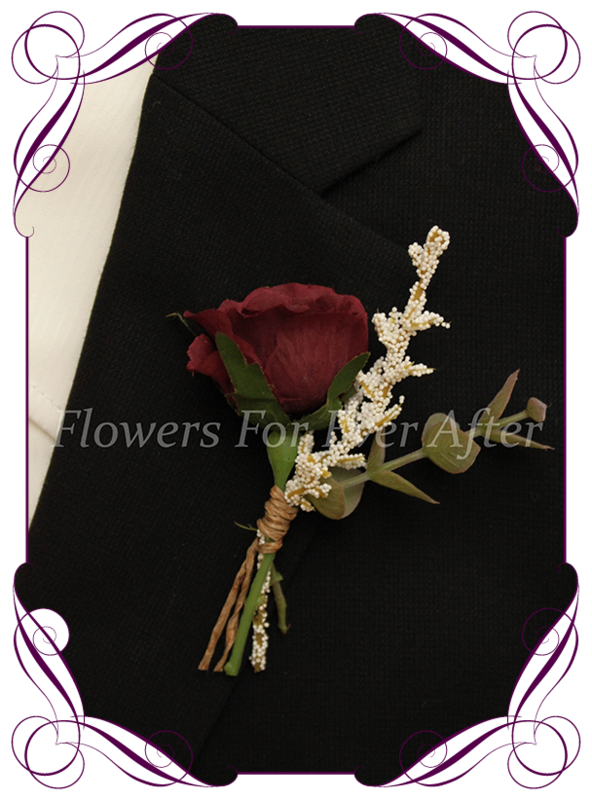 Matching grooms button can be added via drop menu below. 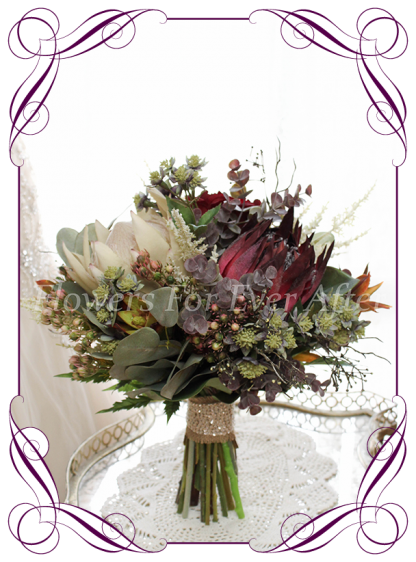 Features an ivory protea bud, burgundy rose, mauve/green astrantia, raspberry brier berries, ivory astilbe, mushroom blue gum, leucondendron, twig branch, and sage eucalyptus foliage. 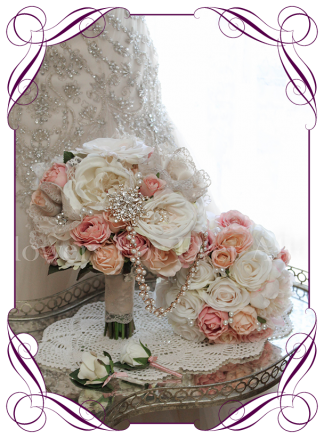 Bouquet handle finished in burlap with a crochet lace sash. 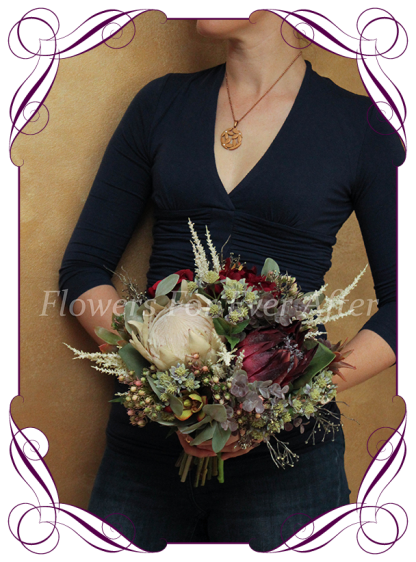 Measures approximately 24-25cm (9.5 inches) across at widest point. 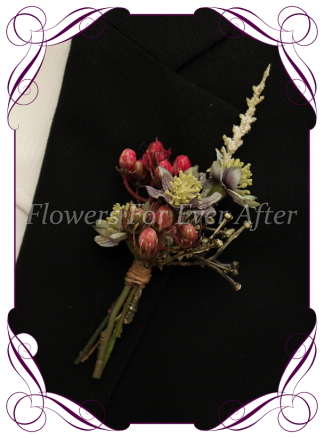 An unusual cluster style gents silk boutonniere design. Features sprays of berry, astrantia, twig, and astilbe, with twine on the stem.